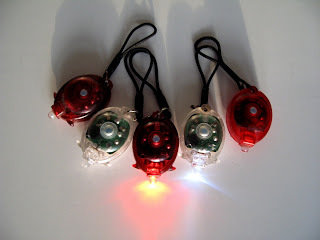 These are my bikes lights. I also have a fixed red light on the back of my bike. In most Danish homes and bags you'll find a ragtag collection of bike lights. Many people are installing fixed lights that work when you ride but are otherwise off. I use the ones above. They're cheap, they are legally within the law regarding strength and visibility. And, if they break, I just buy new ones for 35 kroner - roughly 7 dollars. All bike must have lights on from sunset to sunrise as well as in weather with restricted visibility, for example fog and heavy snow. A two-wheel bike must be equipped with at least one front light and one back light. On bikes with more than two wheels there must be at least one front light which must sit no higher than 50cm from the bikes farthest left point. If the bike is more than 1 metre wide there must be at least two back lights. The back lights must sit no higher than 40 cm from the bottom edge and with at least 60 cm between them. If the bike isn't over 1 metre wide, one back light is sufficient and it must sit in the middle of the bike or to the left of the middle. The lights must be placed on the bike and not on the cyclist. Bike lights in back pockets or on the leg must not be used alone but you're welcome to use them as a supplement to the ones mounted on the bike. A bike light must be clearly visible from a distance of at least 300 metres without being blinding. The light must also be visible from the side. The front light must be white, blueish or yellowish. Front lights that are white og blueish can flash at least 120 times a minute. Yellowish front lights must not blink. Back lights must be red and a back light may flash but it must be at least 120 times a minute. tags: "bike accessories", "bike laws", "bike lights", "danish design"